It’s that wonderful time of year here in Ohio, the leaves are changing colors, the days are getting shorter, the air is crisper, high school football is in full swing and I hurt. Every year at this time I think about moving south. Why? The weather changes hurt me. Spring and fall the most. Wild weather fluctuations accompanied with big fronts and rain are the worst. In Ohio, we have these in spring and fall. Lucky me. This fall is no different. I want to be out enjoying all the beauty that fall brings but the pain keeps me from doing as much as I would like to. The solution? I would love to move to a warmer climate. I lived in Georgia several times and despite the mountains and cooler temperatures, my lupus didn’t hurt as bad there. I’m not sure why. I think it is because the weather there, while it does change, is not as unpredictable as here in the Ohio valley, or as we call it sinus valley. Yes it rains down there, but for reasons unknown to me, I just didn’t hurt as bad as up here. Does that mean I would move back? If I could. My choices of where to live the remainder of my life are (in no particular order) Arizona, Texas, Kentucky, Georgia, and Tennessee. Kentucky is my favorite because my familial roots are there. I know the weather isn’t much different from Ohio but my heart wants to live there. All the others are gorgeous in their own right and I would not hurt as bad. It’s mostly a dream though because my finances say I cannot afford to not only move, but live elsewhere. Does the weather affect you all? What hurts you the worst? Hope today is a pain free day or as pain free as it can be. 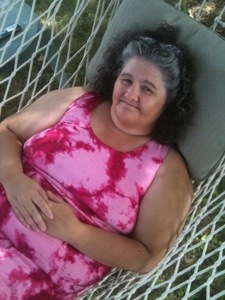 I leave you with a picture of me in the backyard enjoying the hammock on a warm autumn day. Spring May Have Finally Sprung? Well my friends, I think we might actually have lift off for spring! A few times it looked this way only tone buried under snow again. Thankfully, I think the true spring has taken hold so off we go! I love this time of year despite my body’s trials. This time of year brings a sense of renewal to body and soul. The thoughts of beautiful things, such as flowers and babies fills my mind. I have been in pain, yes, but somehow the beautiful weather dulls it a bit. Psychological, yes, most likely, but it feels great to be alive in spring! I am planning my garden and getting excited to be growing heirloom plants that are more nutritional than the GMO substitutes available at most stores. I am happy to start my flowers too. I am also planning an herbal garden so I can use fresh herbs in foods. Yes, I love spring!! Our lupus walk is approaching as well. Still have no team members and I am the only donater so far but I refuse to let it worry me. I have made it to this side of winter and today, nothing will slow me down!! Things will improve, I am sure! I have also been working on organizing the house. I need to get things in order so that I can relax and enjoy the warmth of spring and summer that is quickly approaching! Funny thing, I never enjoyed spring cleaning before but after this particularly hard winter I find myself enjoying it!! So off I go to face my day! I hope each of you will slow down and appreciate all Gods Works during this season of warm renewal of life!! I will be!! I have been a little out of sorts lately. I have had to undergo a whole slew of tests and still have more coming. It seems I am falling apart. Not really, but it feels like it at times. I will detail later what is going on. Suffice to say, I may need surgery in the very near future. Yuck! In the meantime i am concentrating on good things. For example, this weekend I am going to Kentucky for my niece Megan’s baby shower. I am not driving so hopefully it will not be too bad on this old body. The weather is crazy right now here in Ohio. I know that Ohio is unpredictable, especially when it comes to the weather but getting several inches of snow one day, causing car pile ups, school delays and such, and then it all melts the next day! Hm, wonder why I am in so much pain lately? I have no clue.<insert sarcasm here>. This is a time of remembrance as well. Reflecting on the love God has for me by allowing his own son to die for my sins is a pretty big deal. This time of year reminds me that I am not worthy to be a Christian, yet God has provided a ransom sacrifice, in the form of His son, Jesus, so that I can be one. I am grateful for that gift. I also found out that unbeknownst to me, I am a great grandmother! My granddaughter, Leng, had a baby girl seven months ago! Leng is my step granddaughter but I claim her as my own. Her beautiful daughters name is Jean. I understand why I was not told but no matter, I am a great grandmother!!! Happy happy joy!! Another little girl to spoil!!! Thanks you all for letting me vent a bit. It is the way I can get stuff off my chest. You all rock!!!! Than you so much! Hope each of you have very happy days today and in the future! The title says it all… a new day today! It is as if all the last few days never happened and things might be getting better, finally, but I will not hold my breath…so here is today’s installment living with lupus and the ups and downs we experience on this roller coaster ride…enjoy the read! You see, this disease can do things like this and make you feel like you are losing your mind at times. It is hard to wrap your mind around one day laying in bed and the next feeling good enough to paint rooms and cook dinner. Yet, it is how this lupus treats us. Some days, you can be fine and busy and productive and in an hour or so, be flat on your back in bed. It is the nature of the beast, the beast being the wolf called lupus. It is the reason many of us have had to leave lucrative careers and retire early or go on disability. It cannot be predicted which days you can work so since those “dream” jobs of working at home are few and far between, we stop working. It can make you feel like a failure when you cannot work anymore like you used to. So, I did get a lot accomplished today despite the fact that I am still in pain and my joints are still hurting. Just not as bad as they have been. Now, tomorrow we will see if I overdid it. I hope not, but I am afraid that when these good days come, I tend to overdo to make up for the days when I could not do things. When that happens, I pay a heavy price the next day, usually, but I have been pleasantly surprised sometimes too! My daughter did call today and told me that the school my granddaughter goes to had another mishap with the bus and getting her home. This is the second time in the month and what makes it worse is my granddaughter is only 5 and in kindergarten. If my daughter doesn’t call the school, I probably will. It is reprehensible what they have done in this first month! I am livid and will not settle down until something is done to rectify it or someone listens and makes amends. Poor thing, my granddaughter is dreading school now and she loved it last year! The difference? She attended private school last year and this year she is in public schools. It is a sad commentary on the public school system that these things can occur, especially in this day and time when safety is a major concern. Another thing that has occurred is that my hubs went camping for a few days with just our dog for company. He enjoyed it but came home today with a stomach bug. Bad way to end a relaxing trip. Well, now tomorrow is a new day and I hope it will find everyone happy and pain free! May you be able to accomplish all the things on your list and feel a sense of pride and accomplishment in doing so. I did have a few bright spots this week though. I got to babysit several of my grands and it gives me great blessings to spend time with them. They can make me smile on the worst of days. Their youthful innocence is a sight to behold, and their empathy is outstanding. They accept you for who you are and what you can do that day. They do not care if I cannot roughhouse with them. They only care that we can snuggle and hug. I wish more grown ups were like that. It is just another day here in my life. I have had a difficult week. This flare is really causing me pain in my joints and in my head. I have gotten out and tried to do some things this week but the heat is also my enemy. Yeah, I know, I gripe all the time. For you normal people, it would seem that way. For those of us with these diseases though, griping is our way of letting the anger go, the anger that we have these diseases, they are incurable, and we have to live with them. The anger that some people misunderstand our pain for laziness, and think we want to get the attention. That is not true at all! We are genuinely ill and with no cure, we are facing the rest of our lives with uncertainty. The wars raging on the inside of our bodies are not visible on the outside but they are still there, causing pain and discomfort. So, do not judge us, please try to understand us. We cannot “buck up” and overcome our fatigue, pain and disease. If we do that, we are setting ourselves up for a backlash from our bodies. To a degree we can buck up, but the results are often days of pain following. We have had to learn to listen to our bodies cues, and if it says rest, we rest. If we are able to participate, we do that as well. We make plans knowing that we may or may not be able to follow through with them. So please, try to understand and do not pressure us to do things or think we are less because we cannot do certain things on certain days. We feel bad enough without judgment from others. In the end, this week we got a lot accomplished at the house. This is a job of immense size and we are hoping to get it a little chip at a time so it does not overwhelm and overtake us. I cannot wait to get it done so I can see the finished product. I have high hopes that it will be good when it is done and finally we can relax. I hope you all have had a great week and stayed cool from this heat! It is not easy to even breathe in this heat. Take it easy and hope you are all well. Ignorance is defined as : the state or fact of being ignorant : lack of knowledge, education, or awareness. (Merriam-Webster dictionaary). Now to expound on this, let me state that in a normal world things are the way they are and in the world of lupus, things are not what they seem at all. While I can excuse this lack of knowledge in some people, it is harder to do so in others who have been told the facts and have lived with them for years. In this instance, the ignorance is of their own choosing, their choice in the knowledge they have and choosing not to use it. Are you still with me here? In other words, if you have been told, shown and learned that lupus affects everyone differently, why would you all of a sudden expect someone with lupus to , for example, begin an exercise regimen during a particularly bad flare? Making the person feel inadequate because they have extreme fatigue and cannot keep up with their normal routine and have to take naps is not only ignorant, but can also be dangerous to their health if they do indeed try to appease your vision of “health”. This is not to say that exercise is out of the question entirely, but, due to tha nature of the disease, some days just getting out of bed is all the exercise a lupus patient can deal with. To decide that the person is lazy and needs to work out more, is, in fact, ignorant. Let me explain this yet again, because apparently some of those out there have not heard or learned from the past and medical experts on this subject. Getting the proper amount of rest is extremely important for people with lupus, especially during periods of disease activity (flares). Damaged and inflamed muscles and joints require rest to heal. Rest is also vital in reducing fatigue. Although everyone has his or her own particular sleep requirements, at least seven hours of sleep a night is recommended for people with lupus. It is also important to be aware that too much sleep isn’t healthy, either. Spending all day in bed may make muscles weaker, which can contribute to feelings of fatigue. Napping during the day may be helpful and even necessary when lupus activity is causing a flare. Try to allow extra time in your daily schedule for rest. This will be different for each person. When I am feeling good, I will do things, as I am able, and feel a sense of accomplishment. However, when I am in a flare, I do not need to be belittled or made to feel like the few things I do get done are not enough. This makes me feel worthless and can actually make the flare worse. Depression only hurts me, not helps me. I was diagnosed with systemic lupus. Are there any do’s or don’ts with regards to exercise? Having lupus can make the demands of everyday life challenging. When lupus is active, symptoms of joint stiffness, pain, extreme fatigue, confusion, or depression can make even simple tasks difficult, and sometimes impossible. And, because you may not have any visible signs of disease, the people around you may not realize how much discomfort and pain you are experiencing, or they may not know that you are sick at all. You should not ignore the limitations that come with this disease. But there are steps you can take to stay active with work, relationships, and events that enrich your life. These actions and strategies can lighten the burden of your illness and allow you to lead a life of accomplishment and achievement. Just like everyone else, people with lupus need to exercise regularly or engage in some kind of movement, and most people with lupus can take part in some form of activity. All exercise plans should be discussed with your physician or exercise specialist in order to maximize results and minimize possible harm. Activities such as walking, swimming, bicycling, low-impact aerobics, certain types of yoga, Pilates, stretching, or using an elliptical exercise machine will strengthen your bones and tone your muscles without aggravating inflamed joints, while also helping to lower the risk for developing osteoporosis. It’s also a good idea to vary the exercises, so that different muscle groups all get a regular workout. So, while exercise is wonderful, each patient needs to know their limitations and those around them should respect that. As I stated before, some days just getting out of bed is a major accomplishment and on others, things can be as near normal as other people. When you are first diagnosed, learning these limitations takes time and learning to “listen” to your body. After many years of living with lupus, you are more aware of your limits and able to gauge how best to handle them. I guess that is why I am so upset. I have had this disease for many years now, and I have coped with the challenges it brings. I have dealt with the ignorance of others, many of them family members, who think I am just being lazy and that sort of thing. However, in my own body, I have this war, that rages daily. Right now it is roaring out loud, making me miserable and extremely tired. Along with that I am grumpy too. Sorry if that offends you. Sorry if you think you know what is best for me. Sorry you will not listen or learn so you can show me the respect I deserve and the assistance I need. Most of all, I am sorry that you choose to be ignorant. Thanks for letting me rant… sometimes it help getting it out.